Safety Equipment has never been such an important topic as it is today, and the importance/emphasis grows each racing season. Therefore, is important to understand what safety products are available, and how they affect the driver&apos;s safety. Each manufacturer has their own recommended sizing and usage charts, as equipment fitment varies from manufacturer-to-manufacturer. Here in our Technical Center, we have attempted to compile the most recent comprehensive overview of these companies and their products to help you and your driver make an informed and educated decision as to the exact safety equipment you need to be safe while at the track. Below who will find sizing/fitment guides to help you choose the proper Driving Suit whether it is a one-piece suit or a two piece (jacket/pants). If you need other driver or crew safety gear, please visit our other tech pages for Racing Helmets, Driving Gloves, Driving Shoes, Head-Neck Restraints and also Racing Seats. And always remember, if you have a question about choosing the proper safety equipment, please contact our knowledgeable technical sales staff for assistance. SFI® 3.2A/5 is where &apos;3.2A&apos; is the foundation’s standard for driving suits and 5 is the rating. The higher that rating number, the better the protection. In this example, the number 5 is the most important number you will see. SFI® 3.2A/5 is the most common rating. Other rating are 3.2A/1, 3.2A/3, 3.2A/10, 3.2A/15, 3.2A/20, 3.2A/25 and 3.2A/30. PROPER FITMENT - A properly fitted racing suit not only provides protection against injury, it’s a vital component to maximize your performance behind the wheel. If a race suit doesn’t fit properly and is uncomfortable, your performance could be adversely affected. 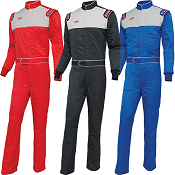 Accurate measurement of the driver is critical to ensure that the racing suit fits properly and is comfortable throughout a long day or night of racing. 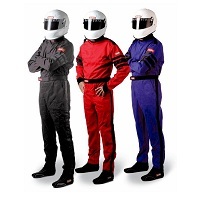 Drivers come in all shapes and sizes, so racing suit manufacturers offer a wide variety of &apos;Standard&apos; sizes, as well as custom &apos;MTO&apos; (Made-To-Order) racing suits. Most drivers can find a standard size suit that will meet their performance and fit requirements, while some other drivers are harder to fit and will require a custom suit. Getting the proper measurement for standard racing suits requires a few basic measurements of the driver. Standard racing suit measurements include the chest, waist, inseam, neck, height, and weight. Custom MTO race suits require additional measurements such as sleeve length, center back length, natural waist circumference, rise, thigh, hip, collar bone-to-crotch inseam (and bra size for female racers). Getting accurate measurements is critical to getting a racing suit that is comfortable and fits you properly. Once your measurements have been taken, it is very important to refer to the sizing chart specifically provided by the manufacturer to ensure that you purchase a suit that will fit you correctly. Sizing charts can vary significantly from brand to brand so be sure to use the correct chart from your chosen brand when ordering your race suit. Just because you wear a size large racing suit from Brand X, doesn’t mean that Brand Y’s size large racing suit with provide you the same fit. Please refer to the factory racing suit sizing charts provided below to ensure proper fitment. Need a &apos;Custom Suit&apos; (MTO) made for you? We have also provided downloadable PDF links to Factory Custom Suit Order Forms for all brands that offer &apos;Custom-Made&apos; racing suits services. 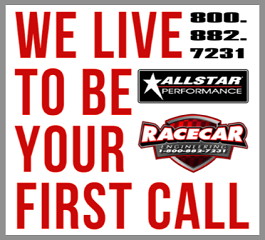 Please remember that Racecar Engineering™ carries a full assortment of brand-name racing suits. 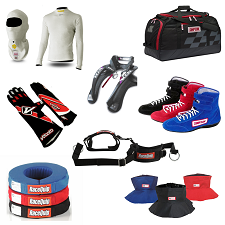 On top of hat, we also have in stock and ready to ship, driving gloves and shoes, underwear, hoods, socks, helmets, helmet supports, harness pads, restraints, helmet skirts, gear storage bags and much more.